It’s time for the Harvest Festival again, and Phyllis is determined to bake a killer pecan pie. Hollywood comes to Weatherford, Texas, as a movie company arrives to shoot scenes for a film based on the novel by Phyllis Newsom’s friend Eve. But movie fantasy turns to deadly reality as a murder recreated for film turns out to be the genuine article, and once more Phyllis has to track down a cunning killer to see that justice is done. 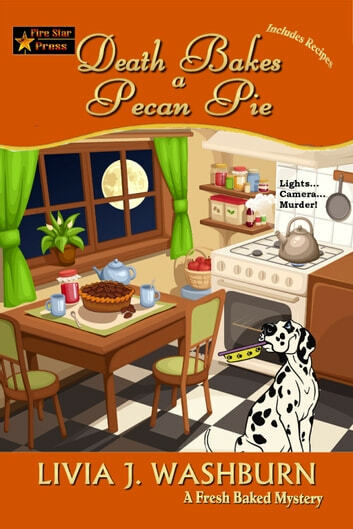 Death Bakes a Pecan Pie is the fourteenth novel in the critically acclaimed and best-selling Fresh Baked Mystery series. Phyllis and her friends tackle another complex case with all the humor, camaraderie, good-hearted warmth, and delicious recipes that have made readers around the world fall in love with this series.